We made 36 pairs just for fun and they all sold. I do want to find a way to turn that sad emoticon face to a smile though. What size are you? I may be able to find you a pair from one of our retail customers though I can’t promise. They are available in size 11. Are you looking for this style in black or red leather? Black leather is easier to come by. If you email our customer service at orders@mellowwalk.com we will do our best to help you find a location near you. Thanks. Thank you for responding. I’ve done as you suggested and sent an email. Please make these shoes again. I am tired of plain black safety shoes. I would love a pair as well. These red Daisy safety shoes have generated a lot of excitement. As mentioned on this page we are out of stock, however please let me know your size and I will see if I can find you a pair. Thanks. I wear a size 8. Thank you so much for looking. I will keep my fingers crossed. I bought these boots about 6 months ago and they are fabulous! I have received countless compliaments on my boots and they are super comfortable. Continue to make these fabulous and fun women’s work boots! More colours please! Thanks for letting us know about your experience with our Daisy 421094 boots. I’m glad you like them. I will see about whipping up a new batch of Red boots in our Mellow Walk oven. Cheers. Please do keep working on getting more colors. GREAT IDEA and FUN! Mellow Walks are GREAT for my 9.5 WIDE feet, I have 6 pair of Mellow Walks now, lack ups and slip ons. When you make more Mary Janes, I’m in. Even better if they should appear in color again. Thanks for writing. You do have a couple of options. Steel Toe Shoes will ship to your door. They do carry Daisy 420092 which is a low cut sneaker style shoe. Our taller Daisy or Vanessa boots are not currently available in the U.S. but this should change shortly. 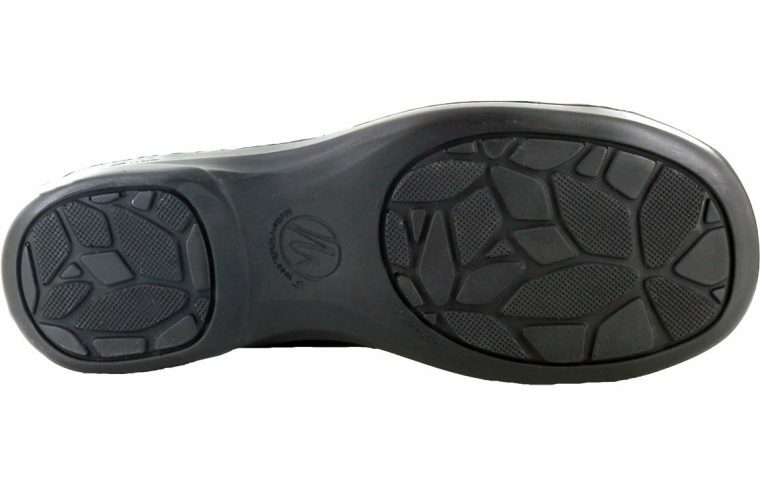 Safety Solutions does carry our 6″ inch Maddy boot which is another great option. Mellow Walk is known for its great fitting light safety shoes. Our philosophy is zero break-in period. I will email you a copy of our sizing chart to help with your selection. Thanks again, and a happy (early) 4th of July to you. Merci Nadine. We are so happy that you love your new Rouge Daisy safety shoes. Would you check whether a size 9 or 9.5 is available? This safety bootie is the nicest i’ve seen. Someone should seriously think of more style, design and colour options for women’s safety footwear. For those of us that do not wear a uniform, stylish, comfortable and functional footwear is important – when you look good from head to toe – you feel good! Thanks! I completely agree with your sentiments. I also hate to disappoint however we currently have this boot only in black leather at our factory. I did a web check and it is available from Belmont Securite in Montreal. Do you make any of your women’s steel-toe shoes in a wide fitting/ i have a wide foot and very high arch and can’t wear a “regular” fir for more than about half an hour without sever discomfort/pain. 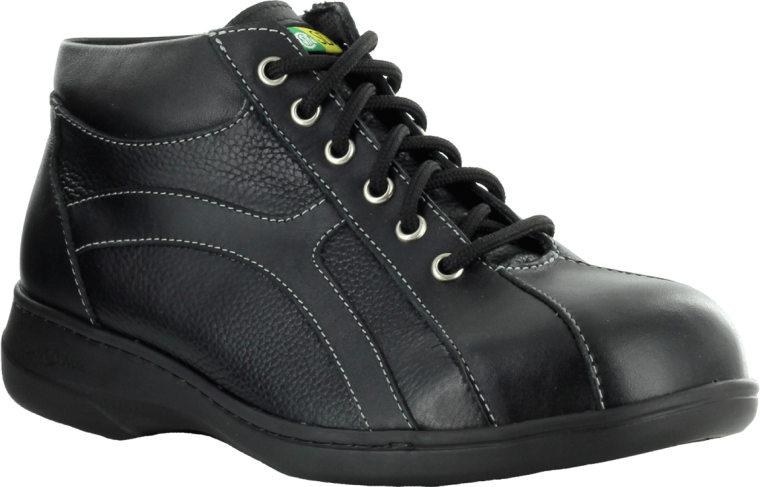 Our widest women’s safety shoe is an E width. I would describe this as wide fitting however if you haven’t yet done so you may wish to try a pair on to see if it fits you properly. You may wish to consider either our Maddy or Daisy lines of safety shoes. Thanks for writing to us. Can you check to see if you have a red steel toe in 6.5? I will send you an email if we do have that red 6.5. IF we don’t you may wish to contact Belmont in Montreal. They do have inventory and I believe they can ship to you. Thanks. Will you be producing another batch of the red Daisy boots? I am looking for size 9 or 9.5? What a great change from the black! Thank you Chris. We continue to get amazing interest in our red Daisy boot. I will check if we have any production scheduled for this boot. If you are looking for something out of the ordinary, you may also like our new Vanessa 412109 motorcycle boot (yes it’s black) but totally awesome. also..I did a Google search of ‘find a store of your product’ and see that the stores that carry your products are only in the GTA area. I live up in the country and would love to be able to “see” and “feel” and “try” your product in places like Orangeville and Hanover and Collingwood. There are Marks stores in all three towns, and a Shoeper store too, in Orangeville. Those stores need a nudge to carry your Canadian made product! Tell/ask you sales force to branch out. I will pass your message along to our sales dept. 🙂 Mellow Walk should be available in Orangeville at both Marks and Shoeper. Neither location will have our red boot though as this is a limited specialty item. I will check to see if we have any 6.5 in our factory. Thanks. Just received in the mail my new RED Daisy boots from Belmont Security from Quebec. Christoph in customer service was great! Hi Chris thanks so much for updating us. I’m glad you are loving your new Daisy red boots. 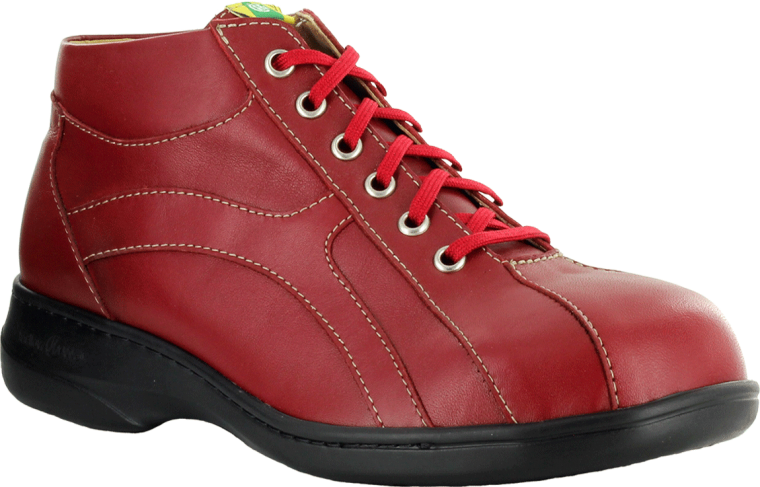 And this is a good segue to let others know that Belmont has Mellow Walk Daisy boots in red leather in stock. HI I WOULD LIKE TO PURCHASE A PAIR OF BLACK DAISY 421094 SAFETY FOOTWEAR IN BLACK AS IM NOT ALLOWED TO WEAR ANY BRIGHT COLORS AT WORK. I LIVE IN NORTH YORK, ONT AND EVERY STORE I CHECK THEY DONT HAVE THEM IN STOCK. PLEASE CAN YOU CHECK AND LET ME KNOW WHERE I CAN PURCHASE THEM. I NEED TO BUY THEM IN STORE BECAUSE ACCORDING TO THE STYLE OF SHOES IT MAY VARY FROM SIZE 10 TO 10.5. THANK YOU PAULA. No problem. We can help with Daisy 421 in black. We can do one of two things, ship you a pair from our factory, or you can visit us at our North York factory (Keele/Lawrence). I will email you separately a footwear sizing chart to help you better select your size. Thanks. Could you please see if there’s a 7.5 available in red. I’ve gone through every site on net and these are THE ONLY ones I’d buy. Please help!! Hi Lynda, sadly we do not have any pairs at the factory. However, our friends at Belmont Securite can help and ship you a pair. Others on this website have also ordered direct from Belmont for this boot. Thanks. Hi I was wondering if you have these in size 10? Please and thank you. We do have these in black leather at the factory. If you would like to order a pair in black please contact natassja@mellowwalk.com she would be happy to help. If you would like a pair in red you may order them from Belmont Securite. Thanks. We take great care to ensure that our footwear fits true to size. Best thing to try on a pair at your local safety retailer. Thanks. Can the Belmont security ship to the U.S.? I was looking for the daisy 412094. Size 10. I would like them to ship right away, I have a plant project starting on Saturday. Please advise where I can get these. Thank you. Hi Andrew: I live in Toronto. I checked the websites of some of the stores which carry(carried) your products but cldn’t find any Daisies. Do you currently have any red Daisies? I think I wear a 7 (have to check my current shoes as I misplaced the box. If possible I’d like to try it on first. Does not matter whether it’s 6″ or lower. I have to try on to see how comfortable. I have to get a new pair pretty soon. Please let me know where I can try one on. Thx. Sorry we currently only have 421094 in black. If you have your heart set on the red I believe you can order it online from Belmont in Quebec. Thanks for your interest. Hi Andrew, Would you please check to see if you have a women’s red steel toe in 9 or 9.5? Thank You! Sorry Deborah. No red however you can order this boot direct from Belmont Securite. I don’t even need safety shoes at my work but I’d own a pair of these they are adorable. I would love a pair of these red daisy boots in red. Could you please check and see if there are any that size around. Or notify me if they will be producing more of them. I peeked into the factory and didn’t see any going through at the moment. We do sell the red Daisy to Belmont Securite so you should be able to order a pair directly from them. Thanks for the response. The site you recommended is in French so I’m not sure if I can get them there or not. Looking for size 11 – wide. They really need to continue with this product; obviously by the requests from people there is enough need for the item. Appreciate any help you can give me to get a pair for myself, hopefully on a site that I don’t need a translator to walk me through it…lol. Do email the store. On very top right side look for “Accueil Contact EN.” Press EN for page translation–top right beside ‘contact.’ Write to inquire about your size. I did, this week. Red Daisy, they said, is only in wide. They have two stores. If they are out they expect more in July or August. “Accueil Contact EN” is at very top right side. Contact is easy. This will work: “Do you have red Daisy in size 11. If so please advise total cost to have them shipped to (your address)” They will respond quickly, with no, or yes and how to pay. If reply is in French use google online free translator English French or French English. Works GREAT. Thanks Trista and thank you Sue for your comments. Great advice and Belmont is easy to work with and will respond in English. Thanks to both of you…I did find how to email to company from another site. I messaged and requested size I was looking for. I have now ordered and paid for them to be shipped to my home. Appreciated the help. AWESOME Sue. I think they are SO amazing but wanting most ventilation possible I’m waiting for the July release Mellow Walk Mary Janes, also wide only. I think 2012 they did red MJs. WAAAAH! Had I only known about Mellow Walk then. My fingers are crossed for more colors. And I got responses from Belmont in English initially AND then in French. Worked nicely. Thanks for that information….I love that style too… that would be a good backup pair…I need more than 1 pair. I will watch for those. She’d like to be contacted and will let you know if she can reserve some for you. I’m delighted with Mellow Walks and since discovering months ago I have lots. Comfort at last! Thought you might like Mary Janes! SO different. Really disappointed that the red Daisy shoes are no longer available. 🙁 As with everyone else, I’m kinda tired of black, no fun, boring old safety shoes. Please make them again. And other colours too! We are still making our red Daisy shoes. In fact, we have an order going through right now for a retail customer. You can order direct from Belmont. Thanks for your interest. Would love a red pair in 10 ladies!! Hi Christie please email Belmont Securite in Montreal. They will be happy to help you find that pair. The staff is bilingual and will be able to answer any of your questions. Thanks. I have been searching everywhere for red daisy. I read you made these for fun. But please make them again. I’m glad you like our red Daisy safety shoes. Good news…we still make them. You can order a pair from Belmont Securite in Montreal. They would be happy to help. Thanks. Hello, i would like to order the Daisy in red size 38 , i have the Maddy 425048 These are the best boots Ever!!! !,… love them Great job. It’s great to hear that you have enjoyed our Maddy boots. The Daisy boot is currently only available from Belmont Securite in Montreal. They would be happy to ship you a pair direct. Thanks.